Looking to purchase a house in Eltham North? Don’t sign anything until you’ve had a building inspection from Inspect East. With crazy Melbourne house prices, plus all the other expenses involved with buying a house, paying extra money to get an inspection done might seem excessive. However, when you’re buying a home in Eltham North you should seriously consider getting a building inspection, and here’s why. While Eltham North is a great suburb to buy in, we’ve come across a plethora of properties in the area with significant issues. When we say significant, we mean things that cost thousands, and sometimes tens of thousands to get fixed. Without getting a house inspection, the buyer is left totally unaware of potential issues and could have a nasty surprise waiting for them. On the flipside, smart buyers who have utilised our building inspections services before going ahead with a purchase have been able to save thousands on the purchase price (over a hundred thousand in one case! ), as they’ve been able to negotiate with the seller based on the issues found. In addition to savings in dollars, they also save themselves huge headaches down the track. The inspection team at Inspect East Building Inspections is headed up by Brett White. Brett has decades of experience in the building industry, with most of it in Melbourne and a lot in Eltham North. His commitment to providing excellent service and extremely thorough inspections is reflected in the impressive amount of stellar reviews we’ve received on Google, which you can check out here. All inspections are conducted by a professional who is familiar with Eltham North, and has a working knowledge of issues common to houses in that suburb. Our inspections are performed according to all the relevant Australian Standards, and if there’s any part of our service that you’re not satisfied with, we guarantee to rectify the issue within 24 hours. In addition to our professionalism and great service, we also offer very competitive pricing on house inspections in Eltham North, so whether you’re after a pre purchase, pest and termite, asbestos, pre sales, pre handover home, or pre auction property inspection, make sure you get a quote from us before booking with another provider. 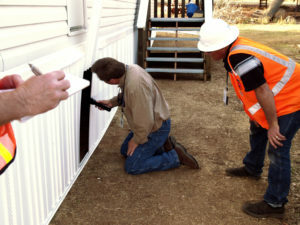 Do you need help with Building inspection or pest inspection report? Fill out this form to get in touch. At Inspect East Building Inspections, we understand your urgency and we are the experts in locating and identifying all those defective nooks and crannies that the vendor is trying to hide so that they can sell the property quickly.